ORLANDO – Every health system understands the potential of precision medicine, but not all of them are quite ready to take the plunge into the complex and expensive project of actually starting a precision medicine initiative. 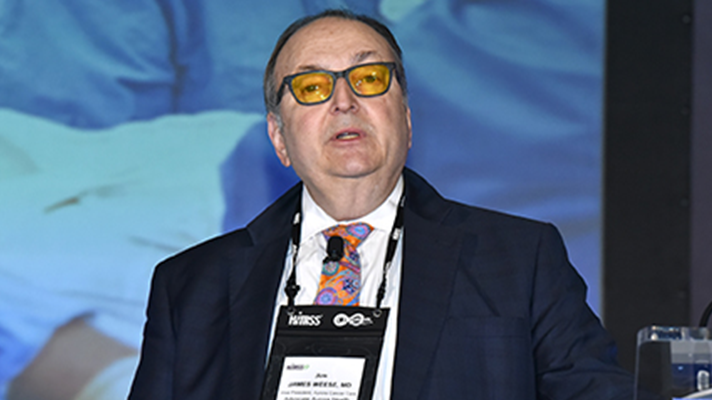 At HIMSS19 on Monday, Dr. James Weese, vice president of Aurora Cancer Care at Milwaukee-based Advocate Aurora Health, offered some up-close perspective on how to assess the success of a precision medicine program and molecular tumor board. Aurora Cancer Care, which treats some 8,000 new cancer patients each year, launched its own precision medicine initiative two years ago, after extensive planning, preparation and goals assessment. What was immediately apparent, Weese said, is that its impact on the bottom line is not the only metric by which a program's worth should be judged. It's key to demonstrate value, he said, and that shows itself in three interlinked but distinct groups. "Value depends on different perspectives," Weese said. "The perspective of the institution, the perspective of the patient and the perspective of the provider." It's critical for any precision medicine program to pay dividends for each of those audiences, he said. Otherwise, any such initiative will just be another overly expensive boondoggle with little to show for it except for frustrated staff. Precision medicine has huge promise, of course, but presents a host of new challenges for even the most advanced health systems. Molecular testing, for instance, represents a sizable burden for already "click-crazy" clinicians, Weese said. Results can take weeks, reports can exceed more than 30 pages, and discussions with patients can take hours. So it's important to make all that extra work show value. Healthcare institutions need to ensure molecular medicine represents legitimate treatment for patients who might have limited options, he said. They should weigh the cost of therapy, the expense of the program at large and the reimbursement rates for very expensive drugs – no small task in itself. Patients, meanwhile, should gain new and valuable treatment options. They should be able to understand how targeted therapies will work for them – something that more and more savvy patients are very capable of, Weese said. And they'll want to be sure that toxicity and side-effects for novel treatments are manageable – and that experimental therapies won't require great expense for something that doesn't work. From the provider perspective, health systems should ensure their programs are properly calibrated toward optimal results. Molecular therapy is "currently most effective in advanced disease," he said. The value of a molecular tumor board is that it "provides interpretation, advice and saves time." It helps steer treatment toward drugs that work and avoidance of drugs that don’t. At Aurora Cancer Care, the organization has determined that "there is value in our precision medicine program," Weese said. But that might not be the case for everyone. An audience member asked him how to raise awareness among the healthcare C-suite and other decision makers that precision medicine is a worthwhile investment. At Aurora, he said, there's an employed medical staff that specialized in getting precision medicine and MT data back out to the primary care physician, who can then interpret it for their patients. Having a "large group who can spread it out to a larger clientele" may be key to building grassroots support by showing value on a wide scale, he said. And much of the impetus for launching many precision medicine programs may eventually come from a groundswell of popular opinion, said Weese: "Patients are becoming much smarter. Many are coming in seeking the opportunity to ask questions about molecular therapy."